A snapshot taken of a Sumo-wrestler as "souvenir" and a work loan by artist colleague Monika Stricker become the starting points of the talk between Shelly Nadashi (born 1981 in Haifa/IL, lives in Paris) and Jennifer Allen. The dialogue of those two things find their equivalent in Nadashi’s and Allen’s mutual interest in issues of language construction and power, especially in working with English as foreign language within the context of contemporary art, bringing up issues of the ability, or disability to communicate in a public sphere. Shelly Nadashi (born 1981 Haifa, Israel) works in film, performance and installation and is currently resident at the Palais de Tokyo, Paris. Jennifer Allen is critic and writer and lives in Berlin. 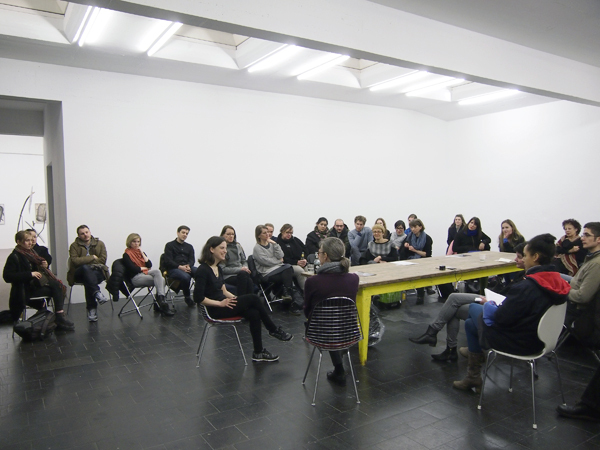 She was chief/editor of frieze d/e and in 2009 she was awarded the ADKV-Art Cologne Prize for Art Criticism.